When an experiment is generated within E-Studio, the Output window provides feedback concerning the status of the generation procedure. The Output window may be displayed using the View menu in E-Studio. Within the Output window, the Generate tab displays information concerning the generation process of the program. For example, if an experiment is generated without errors, the Generate tab in the Output window will display messages indicating that the script was generated successfully. When any errors are produced as a result of generating script within E-Studio, the errors will be reported by a dialog box. 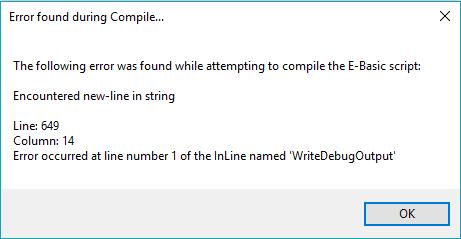 The errors will also be sent to the Debug tab in the Output window. After dismissing the error dialog, the errors may be re-displayed by opening the Output window (View menu) and clicking the Debug tab. Each error will display the line number in the script at which the error occurred, and the Script window will open automatically in E-Studio to display the full experiment script. Within the Script window, the cursor will blink at the line at which the error was encountered.